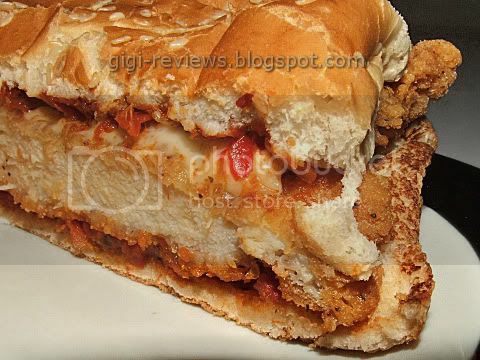 Eh...returning to real life here in Southern California, where good Italian food is as rare as an honest politician...I'm now reviewing something vaguely, somewhat, remotely Italian-style: specifically, Carl's Jr's Parmesan Chicken sandwich. Is there any chance it is going to compete with Fratelli's? Pfffffft, yeah, on what frickin planet??? But, could it prove to be a good fast food option? That's a different matter, so let's find out. 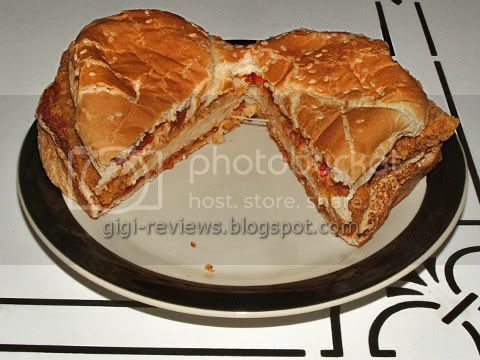 Nestled inside a sesame seeded bun is a fried chicken breast slathered with marinara sauce on the top and the bottom, with a slice of melted Parmesan cheese. The bun, eh, it's a fast food bun. I happen to like the buns Carl's uses. There is nothing special about them, but they do hold up well to sauces and are tasty enough. 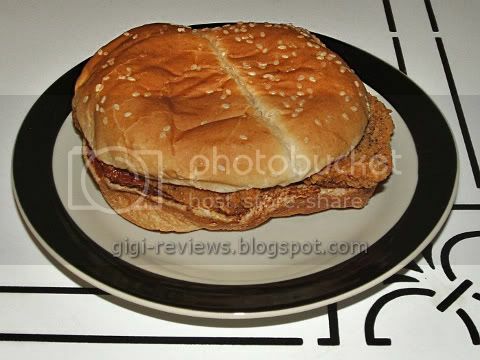 I am sure this is the same fried chicken breast that Carl's uses on other sandwiches. It's got that "country chicken" type breading on it. A little too peppery, but that's the worst I can say about it. The meat itself is moist and lean. The sauce is...well, it's generic canned tomato sauce. Fans of canned sauce may consider this their lucky day. It also tastes strongly of red bell pepper. I hate red bell peppers, so for me this was not a good thing. And it is needlessly sweet in the way that I find nearly all pre-made red sauces to be. The cheese...what, that was cheese? Really? When did Goodyear start making cheese? OK, I can see where small children (and some adults) who are not picky about their Italian-style foods may like this. Me, not so much. In fact, I thought it was damned nasty. The chicken and bun were tolerable, but the sauce and the so-called cheese were absolutely horrifying. I couldn't finish even half the sandwich. When my chicken sandwich craving comes up (about once every three years) I will stick with Carl's Charbroiled Santa Fe Chicken sandwich, which is truly good. Bottom line, avoid this one. Instead, go to the Bronx and have dinner at Fratelli. You'll be happy you did.